A new device called the Pear Square One is a pretty advanced fitness gadget, which aims to track EVERYTHING you do, learn from your past work-outs and provide you with verbal coaching too. The Pear Square one, from the Pear Sports company, is a comprehensive device that aims to provide you with all of the key information you’ll need when you’re working out. Firstly, it comes with a wireless strap-on heart monitor to keep track of all your vital statistics and it’s then got a separate device that attaches to your foot in order to track how far you’ve run as accurately as possible. The clever thing about the Pear Square One is that it learns from your past work-outs. You basically exercise for 20 minutes and based on that data the gadget will then train you up, depending on whether you want to increase your stamina or lose a few pounds. The Pear Square One will also offer you verbal coaching, it whispers in your ear if you should be pushing yourself a bit harder or taking it easy, which may seem annoying but is the only way you’re going to stick to your goals without having an actual personal trainer by your side. Although the fitness gadget market is becoming heavily saturated with all kinds of devices, it’s good to see Pear Sports create something that’s as accurate as possible. We just wonder how annoying it’d be to have all kinds of tech strapped to all kinds of bits of your body!? 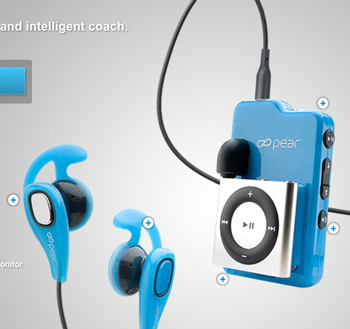 You can get the Pear Square One for $250 from Pear Sports website.